Do you like sleeping on your stomach? If so, you are one of many who prefers this as the best sleeping position. If there's one thing that you need to feel like sleeping on a cloud, though, that's the mattress made exactly for stomach sleepers. Finding one, however, is not a walk in the park. There are quite a lot of things that you ought to take into consideration in terms of specifications. Density, thickness, materials, and a myriad of other characteristics will start popping out of the blue as you start your quest for finding the best solution. What is the Best Type and Material? This is where things can get slightly overwhelming. When you add to this the abundance of options on the market (have you seen our list of top rated beds for 2019? ), you can easily find out that this is no regular quest – it's a challenging task which requires time, effort and, most importantly – some knowledge. Let's face it, the regular shopper, just like you, may not know the difference between latex and memory foam filling, right? What you need is a comprehensive guide to walk you through all of these specifications in a quick and easy to understand manner. That's what we are here for. 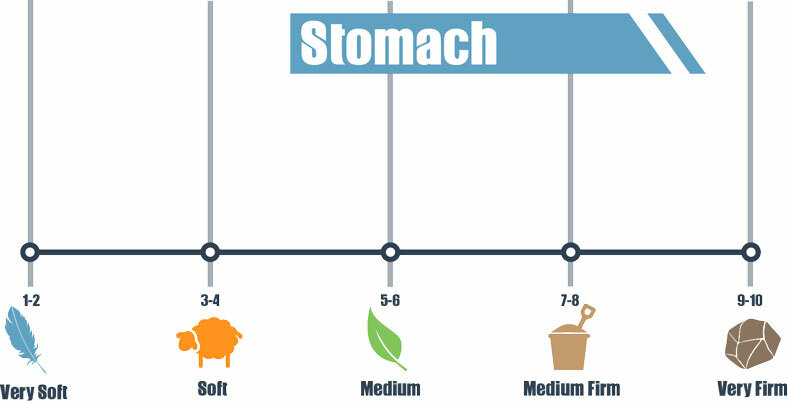 We've taken the liberty of presenting you with the most important things you ought to know about the best beds made for stomach sleepers, so you don't have to wander around aimlessly. Additionally, we will present you with a few of the best options on the market that the majority of customers find comfortable and appealing. So, without any further ado, let's give it a go. The WinkBed has multiple firmness options, but its Firmer version is a great fit for stomach sleepers. It is a hybrid with coil-on-coil construction under designer foams. 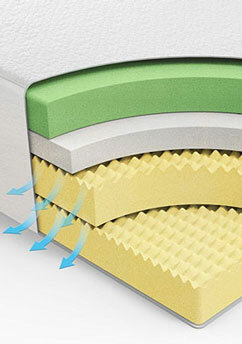 The foam and the Micro Air-Springs™ layers provide just enough pressure relief for areas that could dig into the mattress otherwise, and the overall support of the bed keeps the hips up and out of the mattress. This alignment is important so the back stays straight and hips don’t sag, which can make sleepers wake up with aches and pains. What stands out? This firm hybrid has a base layer of zoned coils for even more support in the midsection. Whether you have a few extra pounds or want to make sure you have adequate support, the strong steel will help to see that you have a comfortable night without sinking in and bowing your back at an odd angle. 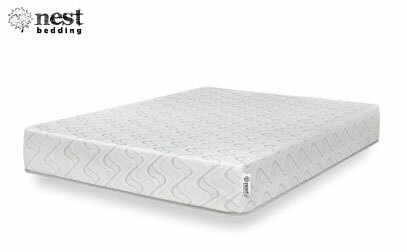 There are many other features to love about this mattress, such as incredible edge support and a durable build. It has a Tencel cover that works to keep the body cool and pocketed coils to help dampen motion transfer. Want to learn more about this option? You can read our full Winkbed review here. 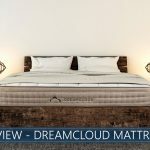 If you are a stomach sleeper who likes more of a medium-firm mattress instead of something much firmer, the DreamCloud hybrid could be your solution. It has the bells and whistles of a luxury design for a fair price, with 365 risk-free days to see if you love the feel (or return it for a full refund!). What makes it special? 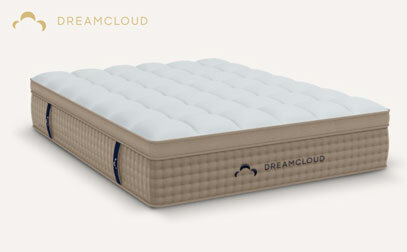 Supportive enough for stomach sleeping, but with some softness and memory foam layers to cradle joints for pressure relief, DreamCloud kicks medium-firm luxury up a notch. The feel of DreamCloud is pretty accommodative to most sleep positions, so couples with different styles can enjoy it together. The coils are zoned in five areas, and stomach sleepers should feel a comfortable level of support in their hip region for good alignment. Eight total layers, a combination of memory foams, hypoallergenic latex, and pocketed coils, are wrapped together in a breathable cashmere/polyester cover. It is as luxurious as it looks. If you want to see how these layers work to provide you proper comfort, you can skip to our full review here. Not everyone is a strict stomach sleeper. Some people spend only part of the night in that position or have a partner who favors their side or back. 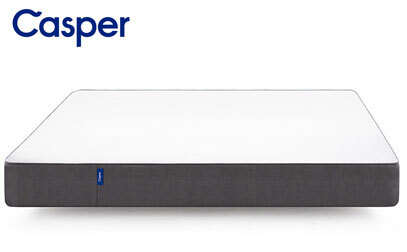 Casper is a versatile pick, largely conducive to all sleeping positions, so whether you are a part or full-time stomach sleeper or lie next to one, this is a mattress that can keep comfort levels high all-around. What makes it unique? Casper has Zoned Support™ in its third layer. This is amazing for stomach, back, and side sleepers, as it lends more support to the center of the body where weight bears down on the mattress the most. The foams are less firm in the shoulder area, allowing for additional comfort and alignment if you need to switch to your side. Part of the magic of Casper is that the foams don’t let you sink in too far, but they also gently cradle the body. The foams are responsive, even with a memory layer in the mix, adapting to the body as it shifts. We made a review of this model, and if you're interested, you can see it here. 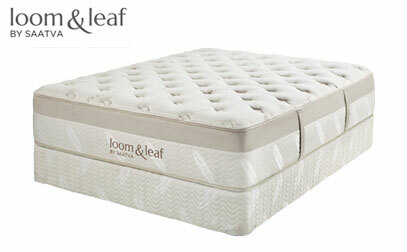 Loom & Leaf comes in two firmness levels and their Firm is a particularly good solution for stomach sleepers. It boasts a more supportive feel on a very luxurious, well-made bed. What stands out? Memory foams can sometimes lack the firmness needed for stomach sleepers, making them feel like they are being absorbed into the bed instead of receiving much-needed support. Loom & Leaf’s Firm option contains memory foam in a design that doesn’t let hips dip too far and helps keep the spine from skewing. Traditional memory foam has also been known to trap the body’s heat and hold it close to the sleeper when it makes up the first layer. However, Loom & Leaf has gel infusions that serve to regulate temperature, with an added gel layer that provides even more cooling. The first layer’s convoluted design and a uniquely quilted cover encourage air to flow, which also helps it sleep cooler, so you stay comfortable. Read full Loom and Leaf analysis that we made here, if you're interested in learning more about this model. Natural American-made Talalay latex, organic cotton and wool, and a healthier sleep are all to be found on Zenhaven, an all-latex mattress that the company claims will save you thousands of dollars when compared to in-store models that can top $4,000. At a fraction of the cost with quality materials and superior handcrafted construction, Zehaven’s Gentle Firm model delights stomach sleepers with its firm support. Talalay, the type of latex used, has an incredibly consistent feel that isn’t the case with all latex. The use of this material is yet another reason why the high-end design is impressive. What makes it special? The nature of Talalay latex is quick responding, with buoyant support and airflow through pincore holes. Zenhaven has taken their product further, strategically creating targeted zoning by varying the size and placement of the pincore holes, which provides additional support in the midsection. Even though the Gentle Firm side will work for most stomach sleepers, if you find you prefer a softer feel, flip the bed over and try out the Luxury Plush side. Who doesn’t love two options for the price of one, as well as a sizable trial period with time to test out both? See our complete review of this latex model made by Zenhaven here. The Love & Sleep is an award-winning, GREENGUARD Gold certified budget bed – that comes with a lifetime warranty. It can be ordered in Firm and Medium levels of firmness, and Firm is our suggestion for stomach sleepers. There is a two-layer design for the Firm model, with an Energex™ comfort layer overtop a dense base foam. Energex™ has a feeling between latex and memory foam, so it has a quicker response time while offering pressure relief. However, the bed is firm enough that stomach sleepers can feel comfortable while staying in alignment as they lie down. 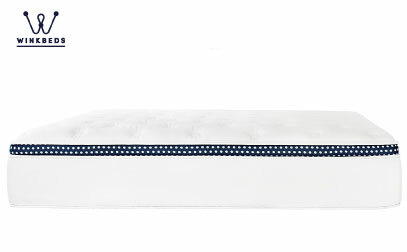 A nice aspect of this bed, especially given its price point, is that it has a phase change material in the cover. This material will help keep you cool, which is good news for people who find they sleep hot on foam beds. What stands out? The price is right on the factory direct Love & Sleep at $599 for a Queen size, making it our budget pick. It is from a well-known company and incorporates phase change materials, which makes it an impressive value. 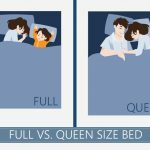 Learn more: Full bed analysis of the Love and Sleep. The truth is that stomach sleepers go to bed every single night in what seems to be one of the worst sleeping positions for your body. With this in mind, you should know that the proper mattress, as well as a comfortable pillow, could make a tremendous difference to seriously overcome the overall negative effects that stomach sleeping can cause on your body. Proper back support, a feel which is medium to slightly firmer, and taking advantage of the most appropriate and comfortable pillow, are essential if you want to get a proper rest while sleeping on your belly. Adequate support might as well be the number one priority that you ought to be looking out for when picking up a bed. This is because your mid-section carries a significant amount of pressure as well as weight throughout the entire day. When you are sleeping on your stomach through the night, the pressure can go on building up in the torso. This could lead to restless sleep during the night and also to serious back pain. Proper support plays a huge role in preventing this from happening. 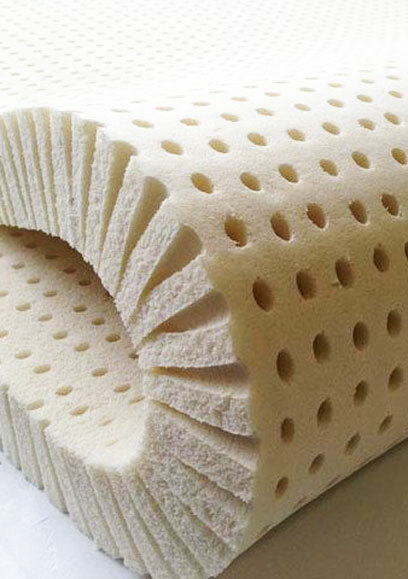 This being said, you can take a look at different foam mattresses as they are known to provide firm and consistent support. This is thanks to the numerous layers of pressure relieving and responsive foam that conforms to the natural curves of the body, and there are certainly some innerspring options out there as well. A few things need to be accounted for here. Right off the bat, front sleepers tend to keep a very flat sleeping profile. This results in a lot fewer gaps between your body and the mattress. Therefore, the best mattress for this type of sleeping should be on the medium to slightly firmer side. This makes it about 4 to 7 on the firmness scale if we assume that 10 is the most firm, but this can be a very subjective thing. This firmness should help keep your back from arching and also from causing stiffness. If you compare it to a mattress which is too soft, your pelvis may start sinking down. This can lead to spine misalignment, which is undoubtedly something that you want to avoid. The right level of firmness can help to ensure proper support of your mattress, and this is, as we already mentioned above, amongst the most critical things to consider. This is undoubtedly amongst the most common types of materials used for different beds. It takes advantage of high-density foam which functions as the main support system. It is usually placed in the upholstery layer, even though newer solutions feature a deeper layer of memory foam as well. The main characteristic of this material is that it contours very closely to your shape and adjusts to your sleeping position. 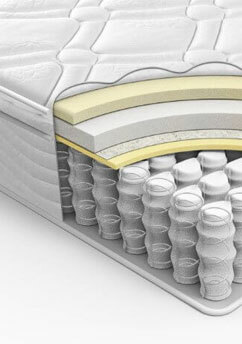 Unlike the memory foam mattresses, latex ones are usually made out of the plant or petroleum-based materials. The latex could also be situated in the upholstery level or, as exemplified above, in a deeper core level of the bed, or make up the entirety of the layers. Generally speaking, an innerspring mattress will use a system which is built of steel coils to support your body weight. There are a few different types that you could take a look at. All of them vary based on the manufacturer as well as the preference of the client. A foam/spring hybrid mattress will have the aforementioned innerspring construction as its core and would be padded with memory foam on top. This is something that you may want to account for, as it combines the benefits of those types, and it's usually a great solution for people who like a traditional feel with added comfort. If you're going to put a lot of effort into choosing the best mattress for sleeping on the stomach, you might as well do the same when picking your pillow because it's just as important for this particular position. With this in mind, if you have an overstuffed pillow, this will likely elevate your head excessively, causing additional pressure points or potentially spine misalignment right to your neck. People in the freefaller sleeping position should take extra care and also realize that the size you need can be heavily dependent on your body's parameters. You might need a slightly elevated or a lowered pillow, depending on your body type, though most prefer a slimmer profile. Make sure that your neck is aligned with your spine when you lay on your stomach and you place your head on the pillow. Of course, additional factors include huggability, moldability, and cooling – all of these are quite important. If you are a stomach sleeper, you've probably had troubles finding the right sleeping solutions. 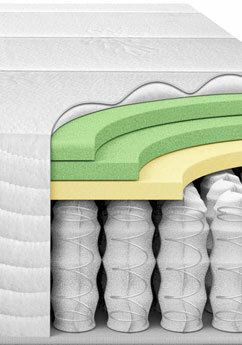 Some mattresses tend to feel too soft, while others – rock solid. It's advisable that you pay attention to the firmness of the mattress in order to ensure that it will provide you with the necessary back support. Get that right, and you're good to go. In any case, make sure to take a look at the things you ought to account for when shopping for your mattress and you'll quickly find out that this is not as challenging as it may seem. It’s very difficult to find a good mattress if you’re a tummy sleeper. Zenhaven meets my needs completely. You can even choose between two levels of firmness for the price of one. I, myself, prefer the gentle firm side. Long story short – it’s a hell of a mattress! Nest & Bedding, Love & Sleep! The firmer one, of course. Perfect for a belly sleeper. Affordable, yet great! Best deal I ever made. I’m so glad you wrote that. I’m waiting for mine to arrive. So excited! Happy to hear it, Susan!